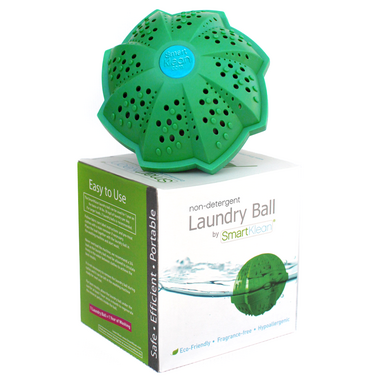 The SmartKlean Laundry Ball is chemical free, environmentally responsible way to do your Laundry using Bio-Ceramics made in Sweden. These are great for anyone with Sensitive Skin, Allergies, Eczema, Psoriasis or just wants to get rid of the Chemicals and save money at the same time. How it Works: The laundry ball is filled with four types of mineral-derived ceramic beads and two magnets, each performing different cleaning functions. When these components come in contact with water, they form ‘oxygenated’ water with an increased pH level and an ability to eliminate germs and bacteria. The result is fresh, safe and clean laundry! Another advantage to the SmartKlean laundry ball is you can skip the rinse cycle to save water as there is no Soap Residue to rinse out (yes no more double rinses!) Or you can use the quick wash going from over an hour per wash to less than thirty minutes depending on the machine being used. Warning: Cleaning your washing machine is recommended to avoid staining from detergent residues. Borax and Washing Soda are recommended for hard water situations. Excellent service and product. Very happy to know my clothing does not have soap residue. Order was placed during the busy Christmas season and product still arrived on time. Thank you so much. Follow well-written instructions and enjoy! Bought my 2nd SmartKlean ball as I use this all the time. Sometimes I add soda wash to boost the cleaning power, but I will never use detergent in my washing machine again! Our clothes and bedding only require freshening up , these detergent balls help to avoid any soap residue. The ease of use is excellent.. I've been using this laundry ball for several years but this is the first time I got it from Well.ca -- and at a sale price too. I've had eczema since I was a kid and this is the first time I found relief - The ball lasts a long time and saves money. I have had this product before. I love it and would buy again. No detergents, saves money and is environmentally friendly. I've been using this product since February of 2017 and am pleased with the result. I like not adding to the proliferation of detergents (even environmentally-friendly ones) and everything seems well-washed and soft. Doing three laundries a week, this product should last well over two years. Everything these days is named SmartSomething, and I associate that name with being under constant surveillance, but since this ball doesn't hook up to my Smartphone, I can honestly say it's an excellent product. I think stains still have to be treated, but the laundry does come out clean and odourless. Love this laundry ball! My clothes come out clean and smelling fresh. I use cold water and there is no need to use a fabric softener either in the wash or the dryer. This is the 3rd year I have used this product, and I am still delighted with it. Wonderful not to have to wash with detergents. Excellent results. The only reason I did not give 5/5 is that you need two balls instead of the usual one, with an extra full, extra dirty load in a large top loader washing machine to get cloths clean and fresh smelling. This is a great alternative to detergents. I've ordered two balls since a ball works best with smaller loads, so when I do big loads I put both in the machine. It does not get rid of tough or oil-based stains, so I purchased a natural stain remover to pre-treat items. I also add washing soda to the load and so far it works very well. Don't waste your money. Makes your clothes smell like metal as you remove them from the dryer and the ball costs about the same as detergent when you do the math of it in the end. Not worth it. It does work! The clothes also come out SO soft! Some stains do not come out though, so you have to check through items and pre-treat with any kind of stain remover. I've been letting the ball dry on the heating vent. Terrific. Just remember to dry it out to keep it recharged (as it's winter, I've been keeping it in a bowl of dry rice). I love not using chemicals, and as there are no suds, I don't need an extra rinse cycle. The ball even acts as an extra agitator in my top load HE machine. I LOVE the Laundry Ball! I was sceptical at first but thought it was worth a try. So happy I did! I'm so impressed with it I put a picture of it, along with the Well website, on FB. I love to share good news! I've been using the SmartKlean balls now for a few years and i love them. There is no way i'll ever go back to detergent again. If you're thinking about getting one you won't be disappointed and you save tons of cash. Love love love this product. This is my second smartklean ball - I love how simple it is , how well it cleans and most importantly, what little impact it has on the environment. My daughter and I have sensitive skin; I never have to worry about a reaction using this. I have sensitive skin and didn't not like how laundry detergent made my skin itchy. 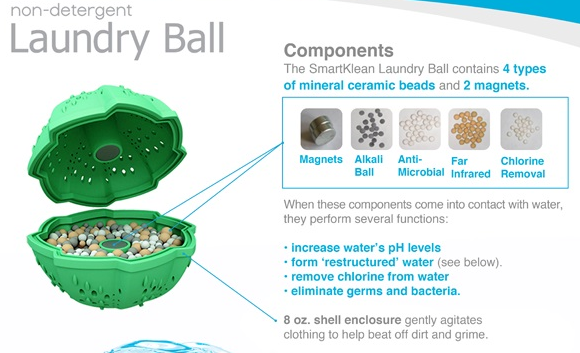 I use the SmartKlean ball and add some vinegar to the wash and clothes come out clean and fresh. Recommend for anyone with sensitive skin. I am very impressed with this product's ability to clean clothes and leave items fresh without any soap. I love this concept for my young children, but find I still need to use soap for some items they get especially dirty. I use this 90% of the time and detergent the other 10%. I am amazed at how well this product works. I was skeptical at first but gave it a try and don't think i'll ever be going back to using laundry detergent.